E-Mon D-Mon Class 3200 electric smart meter with RS-485 communication provides an accuracy of +/-0.2% from 1 to 100% of rated load. It has a voltage rating from 120/208 to 240-Volts, 127/220-Volts and current rating of 200-Amps. The 3-Phase, 3-Wire submeter has 4-line advanced display for reading. It has a time range of 15 mins interval for up to 72 days or 5 mins interval for up to 24 days. 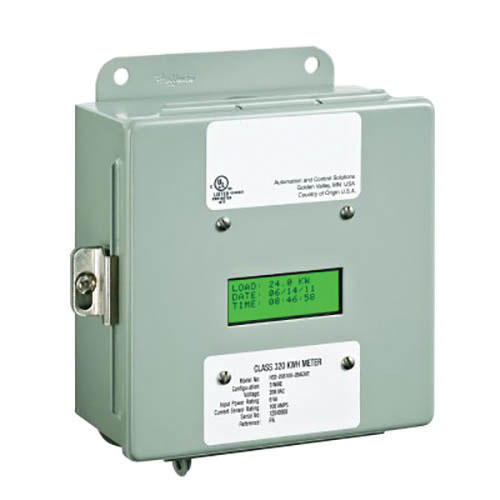 The flange mount submeter has NEMA 4X enclosure that is suitable for indoor or outdoor applications. It has JIC steel construction for high durability. It is compatible with 18-22-AWG conductors for connection and comes with three split core current sensors. It is suitable for 3-Phase, 3-Wire (delta) and 3-Phase and 4-Wire (wye) circuits. This smart meter includes split core current sensors with 2-Volt output. The smart meter meets UL/cUL, ANSI C12.20 and CE standards.